I personally believe every day is a great day for parents like myself to help others learn about some of the unique challenges of raising a child with Down syndrome as well as how much children with Down syndrome have in common with typical children. However, I do think having an entire month specifically dedicated to raising awareness about Down syndrome is a fantastic jump start to help us all remember that every day an great opportunity to rise awareness. For those of you who have ever wondered, “How can I help raise awareness for Down syndrome?” I wanted to give you a few suggestions to help you make the most of National Down Syndrome Awareness Month and help people understand what it’s like having a child with Down syndrome! I hope these ideas help you, and I’d would love to hear what are you doing as well. 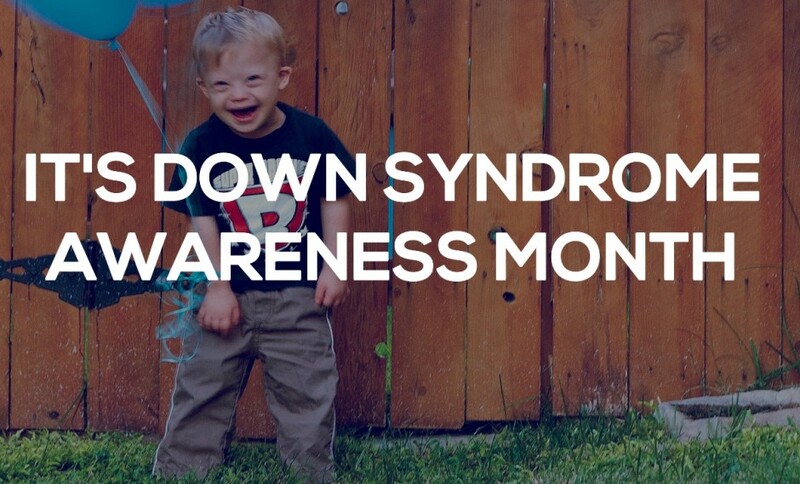 So please be sure to leave a comment after reading this post and let me know what you’re doing for Down syndrome awareness month! By adding your own ideas in the comments you’ll help turn this post into a great list of Down syndrome advocacy resources! 1. Tell Your Story! Tell Your Story! Tell Your Story! What I mean by “tell your story” is just that…tell your family’s story to others every chance you get. Now don’t cram it down their throat, but as you build relationships with others, just take the time (and get over any awkwardness you may feel or worry about creating) to talk with them. Let others have a window in to your life, let them know how you felt when you first received your child’s Down syndrome diagnosis, what sort of challenges you face, and most importantly all of the great things your child is doing. I’ve already wrote about how your story how tremendous power, but only when you tell it! As I mentioned you should tell your story every chance you get, not just in person, but through your social media channels and blogs also. You never know how much of an impact you can make when you take the time to tell (or write) about your story. Heck, I had no idea when I wrote this post it was going to help millions of people learn about Down syndrome, and be written about by press all over the world wide Time, The Huffington Post, ABC, Headline News, Life News, and many others. We even had the opportunity to tell our story on a few television interviews as well. Here’s a couple of them. Now this isn’t going to happen every time to everyone, but if you impact 1 person or 1 million people, you are still making an impact and thats what counts! So this month especially be sure you take time every chance you get to tell your story! You never know how you could change the world just by taking the time to let others in to your world, so go for it! In this video Noah’s Dad talks about World Down Syndrome and what life is like being Noah’s Dad. Noah’s Dad is passionate about helping people learn more about Down syndrome! Another great idea to help rise awareness and tell others about Down syndrome is to create a simple informational video. I made the video above with my Nikon D7000 and cheap lighting set up I bought from Amazon, but your video doesn’t even have to be this “good.” Heck, today almost everyone has a video camera on their cell phone or computer so pull it out and give it go. Just speak from the heart, have some fun, and be yourself. Don’t worry about getting everything right. (As you can see from my example I sure didn’t.) After recording your be sure to email it to your friends, share it on your blog, Facebook, and any other social media channel that you may have. (And don’t forget to come back to this blog post and share your video in the comments below because I want to see it!!! By the way, feel free to post the video I made on your blog as well if you’d like. All you have is click the “embed” button above and past it on your site. Be sure to let me know if you have any questions, I’d be glad to help! I asked our Facebook community what they would want to tell someone about what it’s like to rise a child with Down syndrome and just look at all of these responses! So much great info here! Try asking your Facebook community a question and see what happens. It seems like everyone is jumping on Pinterest these days, which makes it an awesome place to tell your story, and give people a window into your wold. We created a board of Down syndrome resources, but you could create one that highlights achievements by people with Down syndrome, a list of Down syndrome blogs, or something entirely different. If you end up doing this, be sure to leave a comment with a link to your boards because we want to check them out! We realized there were a lot of families in our area raising young children with Down syndrome and while our local Down syndrome guild (support group) is great, most of their activities are aimed at older children (teenagers) with Down syndrome. So my wife and a few of her friends decided to throw a monthly party where families raising a baby / toddler with Down syndrome could get together and have fun! We’ve done this for over a year now, and it’s one of the very best ways to build friendships with other parents in the same life stage as you rising a child with Down syndrome. If this is something you’re interested in doing, I would suggest talking with your local Down syndrome organization; we’ve found that ours has been extremely supportive of what we are doing! If you’re a women talk to your OB/GYN about what it’s like raising a child with Down syndrome. Be sure to them know that if they have a patient whose baby is diagnosed with Down syndrome that you are available and would to connect with them and tell them your story! By the way, our OB/GYN actually asked us if she could give our contact info to a patient she had whose baby was diagonised with Down syndrome….how quick do you think we said YES!? Lots of people are doing this. Just share one fact a day about Down syndrome on your twitter and / or Facebook page. You never know what sort of conversations you are going to start just by doing this one simple thing! Check out all of these great questions people asked! My wife and I are on the new parent committee of our local Down syndrome support group. This is a great opportunity for us to meet new parents of a child with Down syndrome and once again…tell our story! Your local Down syndrome group probably has lots of ways for you to volunteer your time. Why not give them a call this week and ask them where you can plug in? Be sure to leave a comment below and let us know if this is something you end up doing! Instagram is blowing up. What a great way to tell your story via quick snapshots. We’re on Instagram, are you? YouTube is another great way for you to tell your story via videos. Videos are powerful. In fact, watching videos about children with Down syndrome is one of the reasons I started this site! Youtube is a great way to take and share quick moments from your life to give people a window into just how normal your life really is. The videos don’t have to be long, and you don’t have to be a professional videographer to change the world via Youtube. Check out our YouTube channel for some ideas, and be sure to let us know if you end up doing this, because we want to see your videos! 12. 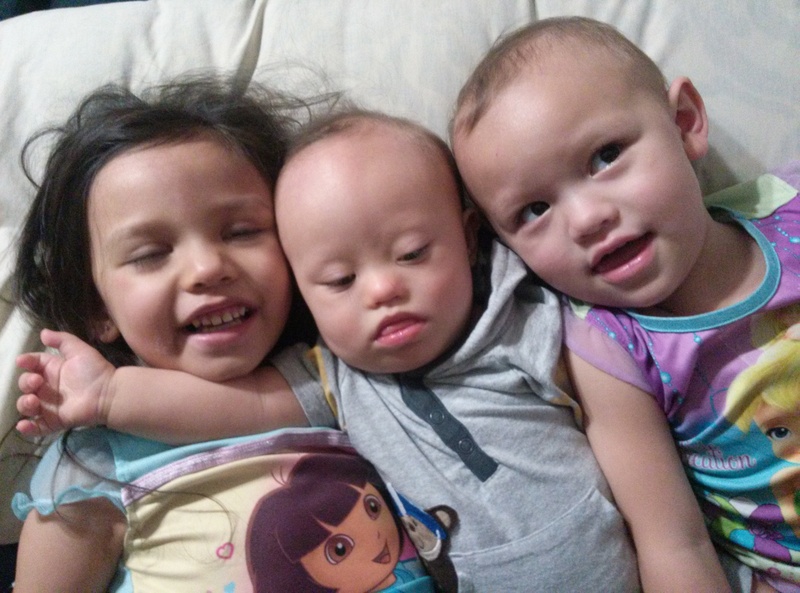 Do A “Top Ten Blogs By Families Raising A Child With Down Syndrome” Post On Your Blog. This is an easy one. If you have a blog, do a simple blog post where you list 10 families raising children with Down syndrome. Feel free to include ours, and check out this list of Down syndrome blogs for other families you can include on your list. By the way we also have a “blog badge” on the bottom of our side bar that we’d love for you to grab and share on your blog! If you end up doing this let us know! If you don’t have a blog, you could post one family’s blog per day on your Facebook and/or twitter account! Another easy one. Check out our Google Plus Page for some ideas, and be sure to click the button below to follow us on google plus! We’d love to connect with you there as well! 14. Sign Up For Our Posts Via Email And Stay Connected! Ok this is a bonus one, but please be sure to enter your email address in the box below to be the first to know when we publish a new post. We want to stay connected to you! Please be sure to help us spread the word by linking to this post on your blog, and sharing by clicking on the social media icons above or below this post! Ok, that’s a few of our ideas to help you create awareness for Down Syndrome awareness month. We’d love to hear which of these ideas you are already doing, and which ones you are going too do. We also know there are countless ways to get involved in Down syndrome awareness month and we’d love to hear what you are doing. Be sure to leave a comment below and tell us about it! Hello!!! I am already the event coordinator for our local Down Syndrome support group for ages 0-4!! It is wonderful to answer questions that new parents have and start those very special parental bonds that is more powerful than any other parents ( of typical children ). We have a great time at our monthly play dates! It is also very encouraging when we are able to help new parents ease into the social aspect. We have had a few families feel reluctant to want to talk to people…. I think at first we have all been there…. And to get them to open up and talk makes a huge difference in those parents lives, when they are feeling alone. Our Buddy Walk is this weekend, and we are so excited to seek those families in their Team Shirts!!! We love being a Down syndrome parent and our Keyan has taught us so much!! We talk to people everyday about what it’s like having him in our lives!!! Thank you for your posts!! That’s awesome! My wife and some of her friends actually plans a lot of events for children in that same range. Not sure if you’ve read some of our posts where we throw the “rockin’ 21” parties (http://sweltering-berry.flywheelsites.com/making-new-friends-support-system/) – but I but she would enjoy connecting with you to learn about some of the things you guys do there! Please feel free to read my article, http://www.christianliferesources.com/article/my-son-maxwell-1481. I will be speaking at their national convention in November on the blessings of having a child with Ds. I believe than once people get over their fears it will make things a lot easier for people with Ds. I honestly wouldn’t have my son any other way. He is the way God intended him to be, and there is no doctor who will ever convince me otherwise. If we all took the time to see with our hearts, the world would be a much brighter and beautiful place. I never knew how lucky I was until I found out Max was 1 out of 700 babies born with it. Follow your heart, and forget the hype. We were blessed with children with DS. Lisa thanks for your comment! Does you son have any siblings? I’m trying to post a fact about Down Syndrome every day on my facebook. Hope to have enough for the whole month but may resort to telling a story or an achievment. Also everytime I see someone post something about Breast Cancer Awarness month I comment by posting about Down Syndrome Awareness Month. Yes I know Breast cancer Awareness is important BUT Down Syndrome is also and it is part of my life. Hi! I have a son that was born on a rainy January day in 1990 who has Downs Syndrome. Over the last 23 years I have experience heartache and sadness, however, more than anything else, I have had so much joy. Now don’t get me wrong, my son is just like everyone else with his wonderful personality and temperament and those times I feel like hanging him on a nail. LOL. I have been in the MHMR field since before he was born and worked with people with many different types of Intellectual challenges. When I am with my son, there is a feeling of joy, contentment and wonder. There are areas in his life that he continues to work on however, there are many he can do very well. He can take you to every place I have worked since he was 2! My daughter said something very profound when we discovered he had Downs that will be with me always, “Mama, you had him for me and I will teach him his abc’s. I will teach him “a” then “b” and so on.” My son’s name is Caleb and he is climbing those mountains and doing it well. Thanks for your comment! It sounds like your son has a very loving family…and I love that! It also sounds like he has an amazing big sister! That’s awesome. What kinds of activities does your son like to do these days? Hi! My name is Jodi Foster and I am the Marketing Director for RODS Racing, Racing for Orphans with Down Syndrome, and we race to raise awareness and funding for Orphans with Down Syndrome. We are a Non-Profit organization and our founder/president is Brady Murray and he has a child with Down Syndrome. His love for his son and his love for racing (cycling, running, swimming, triathlons, Ironman, etc) is what started this organization to help fund the extreme cost of adopting an Orphan with Down Syndrome, because he believes that every child deserves a home and family. We have helped over 8 children with adoption costs in the past year and a half. If anyone is interested in having some fun racing and raising money at the same time, we need you to join our team!! It is a great opportunity to spread the word and awareness for these wonderful children. For more information about RODS, visit us at http://www.RODSRacing.org, we’d love you to join us! Thanks for sharing and for all that you guys do! Way to kick off the month right. Thanks for your energy in getting helpful, optimistic information out about our kids. 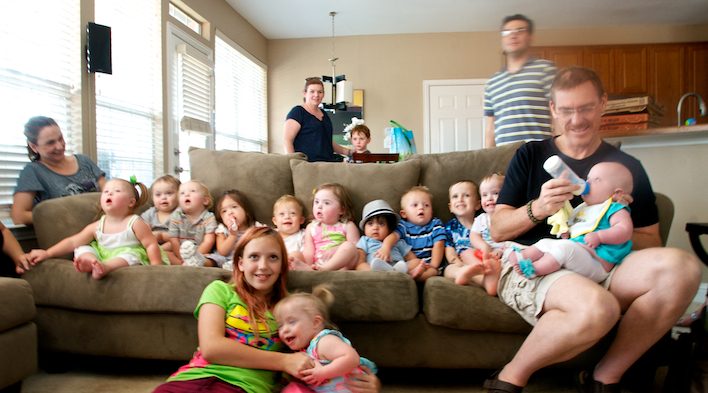 As you know our site, http://funhouseblog.com , shows the life of a large family of six loving life inclusive of our our second child, Seth, who has Down syndrome. 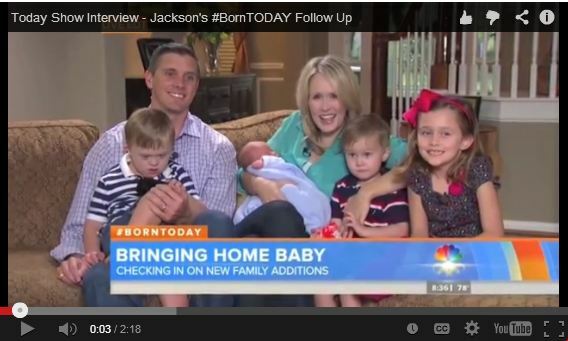 Recently we were featured on the Today Show as part of their #BornTODAY focus when our newest son Jackson was born. http://funhouseblog.com/today-show-interview/ Anytime we get to interact with new people, in this case the camera/production people from NBC and PR people from the hospital, we try to show what a joy it is to have Seth and how he fits in so well with our family. Those who observe us regularly tell us how much of an impact their interactions with our family have had on their lives. On our blog, we do all we can to show how normal life can be with Seth and all the rest of our children and make sure people know that ALL of our children are gifts from God that we intend to raise to give Him maximum glory. We’re a couple of days late to the party but here we are! Nicolas LOVES a good time! Awesome! Thanks for sharing, and for the blog post! Love, love, love, your blog, and your precious little boy! Noah reminds me so much of Charley at that age. Charley is 23 now, but I can see him clearly here in your blog. Thanks for all you do to help the Down syndrome community! Thanks for the kind words about our site! What is Charley up to these days? What sorts of things does he like to do for fun? Charley is always up to something. Mostly having fun, and that’s what makes him so much fun! I love the way you are leading the pack with letting the world know that Down syndrome is OKAY! So what do I have to do to get you to guest post on my blog? It would be such an honor. Blessings to your awesome family. That’s great, thanks for sharing the picture! The dog looks awesome also, what kind of dog is that? Noah has a Golden doodle that he really likes. By the way, I would be happy to write a guest post for you guys! In the meantime you can actually embed the Down Syndrome Awareness video I posted under number 2 on your blog simply by clicking the embed button and copying and pasting the code it gives you on your site. Let me know if you have any problems with it. For anyone else reading this comment I encourage you to post share the video on your blog as well! Thanks! 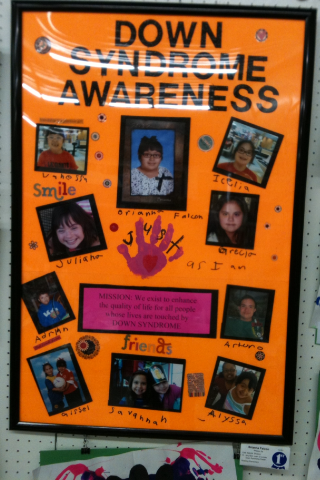 Kicking off Down Syndrome Awareness Month 2013 in a gran way! Bitter Sweet; On Thursday October 3rd, my 10 year old daughter Brianna who is in 4th grade, and has Down Syndrome, was bullied for the first time at school. Best thing that could have ever happened at this time of her life. 1. She had no clue or concept that she was being bullied. NO harm was down to her. 3 girls called her names. 2. She was at recess with her regular 4th grade class, and her friend PAUL, stuck up for her immediately! He told his teacher, his teacher in turn spoke with their teacher, and letters of apology were written, a verbal apology was said. Brianna had just shared a treat bag with her regular 4th grade friends about Down Syndrome Awareness. It must have had a great impact! 3. The school principal has allowed us to put up information about Down Syndrome on a bulliten board on campus. 4. BEST OF ALLl: our local Break the Barriers organization will be performing at her school in the coming weeks. They travel and present Ability Awareness, Outreach and Educational assemblies in schools. Go Brianna for being an inspiration for all kids! I’m sorry to hear that your little girl with Down syndrome was bullied at school. I also have that fear about Noah as he gets older. But the truth is kids get bullied regardless of having Down syndrome or not, but it’s still sad for the parents because you never want to see your child hurt. How awesome that so much good came out of that though! That’s fantastic! And great job on the poster, that is a fantastic ideas! Thanks for sharing! 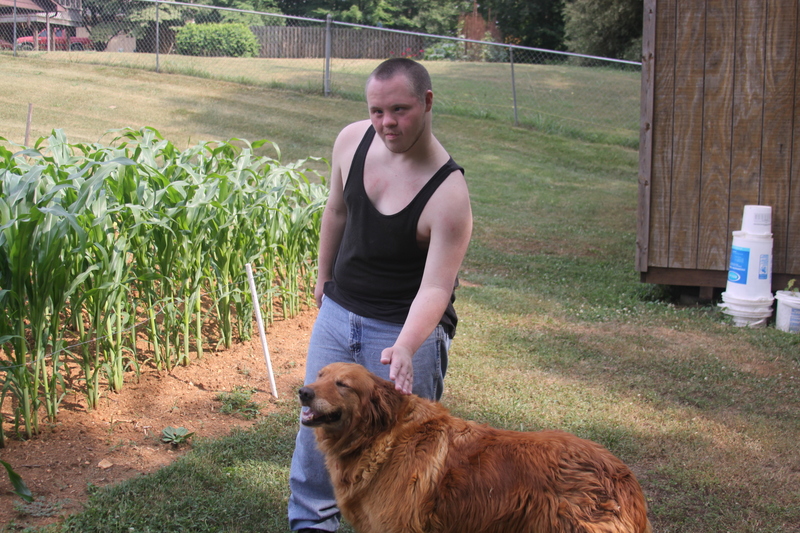 The Down Syndrome Association of Delaware is sharing this blog post on our facebook page. Awesome! Thanks so much, and thank you for all that you guys do! I am going to use an image from tour blog with a line back here, post will be up in the morning. My daughter is 4 and has ds. We are running a combined fall harvest/awareness day for the children at her school, ACDS on Long Island. I would love to give the children “awareness treats” that they can recreate at home and share with neighbors when they trick or treat on halloween. I need to make 300+ of them, any ideas? I’m not quite managing 14 ways to raise awareness of Down Syndrome this month but I have got around to starting a Google+ page and beginning to talk about my experiences raising Sammy. I’m also posting a photo of Sammy each day this month on Facebook, starting from when she was a baby in 1974 and then at different stages of her life. I love your photo’s and comments about Noah and want to thank you for the way you raise awareness of the abilities of people with Down Syndrome and for your love and passion for your little boy. I want to link to this post. Thanks for all you do for the DS community. And you bet you can link to this post! Feel free to link to anything you’d like, anytime! I’m glad to hear your little one is doing well after heart surgery as well. We do. Lily just turned 4, and is an amazing big sister. Congrats on your new addition. We were shocked by David’s DS diagnosis. I’m 31. He had no markers in the womb. He has given us one crazy and sometimes scary ride, but we wouldn’t change him for the world! We are big fans of Noah and what you all have done to educate people of the miracle that our children truly are. We hope that we can do the same with our son’s story. John-Michael was diagnosed at birth with Downs and then several months later with Infantile Spasms. We are determined to spread hope to others who find themselves where we are. We’ve started a blog, a YouTube channel and I currently working on a fiction book that tells the story of what parents experience when they are told their child will have Down Syndrome. Here are some of the places you can find John-Michael. We treat a lot of kiddos with down syndrome for speech, physical, occupational, and play therapy and even have a preschool (Discovery Playground) for “typical” and special needs children. We’ve shared this post on our FB page as well as other posts from Noahs Dad before, thanks for all you do. Hi, I’ve been following Noahs story on facebook for quite a while now and I love it. My name is Sabrina and while I don’t have a child with Down Syndrome I have a 19yr old brother who does. I was 14 when he was born and was over the moon. There had just been me and my (then) 10yr old sister so a new baby in the house was such an exciting time. I was not one bit fazed that my brother had Down Syndrome- I think I just felt a bit sad for my parents especially my dad. Not that it has bothered my dad in the least. He’s fantastic with my brother and treated him the same as my sister and I. He took him everywhere with him and still does. He does a lot with my brother that most men don’t do with their sons. At 14 I didn’t know much about any type of ‘disability’ and I worried that he wouldn’t live very long but thankfully I needed have. One thing that always stands out in my mind is the nurses in the hospital talking to my mam about putting my brother into foster care. I instantly thought ”NO WAY”. I was actually plotting in my teenage head of kidnapping my brother so they couldn’t take him. It seems funny now to think of it but I was very serious. I adored him- still do, more so than ever, and loved to bring his latest photo into school to show my teachers and classmates. It annoyed me at times that my mum wrapped him up in cotton wool and wouldn’t let me take him to the local shop but since becoming a mum myself I can understand her concerns. I felt a little bit sad for my brother at first for having Downs but it was more like the sympathy you would feel for someone with a broken leg (If you get what I mean!) Now a days I’m always on-line researching different things going on in his life. He has scoliosis, dyspraxic tendecies and verbal atraxia too. Sometimes the lack of speech breaks my heart because I’d love to be able to chat with him more and for him to be able to communicate with me more. I live in a different county to my family so I miss my bother a lot. I’d love to be able to chat to him on the phone and for him to be able to share his troubles with me. He will be 20 in January and it seems he has hit his ‘teenage’ years. At night he ‘talks’ to himself for hours on end- laughing and tittering. He could be awake like that til 4am. It does have my mum worn out at times. She worries about what is on his mind. Researching this on-line it seems to be par for the course with limited speech and Downs. Mum is seeing psychologists too. At this age there is not a lot of support out there (in Ireland anyway). He’s finished school so no more speech therapy, physio therapy or any other support. He attends Pathways, a place were he is taught independant living but when that finishes in May next year there is a massive question mark over what Graham can do with his life. But we’re working on it and I for one won’t let any one fob him off. I’ve set up a private group on facebook for people who have a sibling with Downs. It’s early stages but I would love it to become a place where I – and others, can share our hopes and dreams and concerns for our siblings. It is important that we’re not forgotten as we will more than likey spend years with our sibling after our parents have passed away. We do play a very important role in their lives and how we live ours will have an impact on theirs too. I wish Noah the very very best for the future. He is such a beautiful child and seeing your posts about him make my day. My group is ”Having a sibling with Down Syndrome” if anybody would like to join it and share their stories. God bless you and your family, Sabrina. I’m sharing this on my personal blog. It’s mostly fan stuff, but as a mother of a child with down syndrome, I like to spread the word. Twenty-two years ago, he was a sweet, blue-eyed, blond-haired baby with very ticklish ribs! Today, he is a sweet, blue-eyed, blond-haired fellow with very ticklish ribs and studying at our local college! He’s busy with volunteer work within our community and is looking forward to landing a job at a typical, competitive-paid rate. And that’s what’s up with my son. Down syndrome does not keep him down! Question- I am looking for a craft or activity to have our elementary school do this Monday for Down Syndrome Awareness. Any ideas? My son Beckett turned 4months old on Wednesday, he has Down Syndrome and had open heart surgery to correct his complete AVSD on Monday The 10th. How fitting this surgery would take place this month of all times. Your blog was one of the first I ever came across when I received his diagnosis prenatally and is a big part of what motivated me to start our blog to tell our story.